Disassembly of the US’s largest tunneling machine is now complete. On August 23, crews lifted the final pieces of the 8,000-ton giant out of the SR 99 tunnel’s disassembly pit near Seattle Center. Bertha broke through into the disassembly pit on April 4, 2017, and shortly thereafter built the tunnel’s final ring. Though the machine’s tunneling and ring-building work was complete, crews couldn’t complete roadway construction at the north portal until it was removed. Crews from the design-build contractor Seattle Tunnel Partners have been working around the clock, disassembling the machine to make room for the roadway coming up through the tunnel behind it. It was reportedly tricky, tough, and impressive work, re-positioning the machine and dismantling its 8,000 tons of steel into pieces small enough to lift by crane or pull back out of the south end of the tunnel. The largest lift was 70 tons. Larger pieces required additional cutting on the surface before hauling. Hitachi Zosen, the machine’s manufacturer, will decide what to do with many of Bertha’s components. However, her signature 57-and-a-half-foot steel cutterhead was unique to this project and was cut up and trucked to a local steel recycling plant. Hitachi Zosen donated pieces of the cutterhead to the Port of Seattle and donated cutting tools and the control panel to Seattle’s Museum of History and Industry. 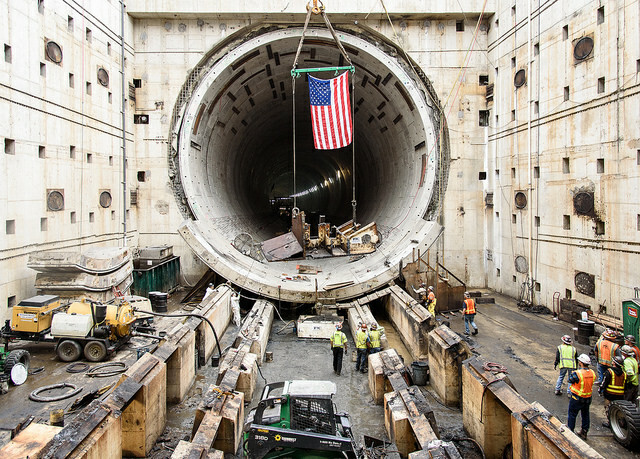 Even while Bertha was still tunneling, crews were building the roadway inside the tunnel and working on electrical and other systems. With the machine completely gone, that work can continue uninterrupted along the 9,270-foot tunnel Bertha dug beneath Seattle. You can follow the work on a new progress tracker page. Owner Washington State Department of Transportation (WSDOT)’s focus is now on finishing the tunnel for an estimated early 2019 opening, along with preparing for the Alaskan Way Viaduct’s demolition, the decommissioning of the Battery Street Tunnel, and improving surface street connections at the tunnel’s north and south ends.